Caraway Essential Oil has a sweet spicy odor with a slight peppery smell. 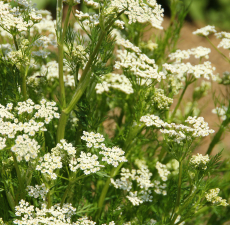 Also known as Meadow Cumin, Caraway is a very old and well-known spice, used as far back as the Stone Age. Caraway is one of the oldest spices and is known for not only its culinary uses but is also of equal importance in medicine, cosmetics and perfumery. The Egyptians used it as flavouring in foods, the Romans in bread-making, and by the Middle Ages it had found popularity among the Germans and Austrians in their cooking as well. May cause skin irritation in some individuals; a skin test is recommended prior to use. Contact with eyes should be avoided.